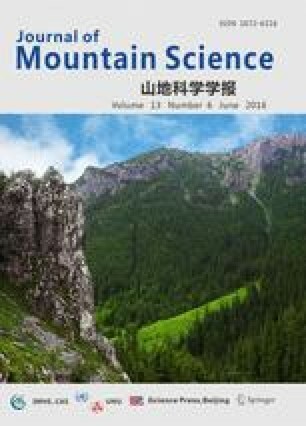 : Understanding the vertical distribution patterns of soil microbial community and its driving factors in alpine grasslands in the humid regions of the Tibet Plateau might be of great significance for predicting the soil microbial community of this type of vegetation in response to environmental change. Using phospholipid fatty acids (PLFA), we investigated soil microbial community composition along an elevational gradient (3094~4131 m above sea level) on Mount Yajiageng, and we explored the impact of plant functional groups and soil chemistry on the soil microbial community. Except for Arbuscular Mycorrhizal fungi (AM fungi) biomarker 18:2ω6,9 increasing significantly, other biomarkers did not show a consistent trend with the elevational gradient. Microbial biomass quantified by total PLFAs did not show the elevational trend and had mean values ranging from 1.64 to 4.09 μmol per g organic carbon (OC), which had the maximum value at the highest site. Bacterial PLFAs exhibited a similar trend with total PLFAs, and its mean values ranged from 0.82 to 1.81 μmol (g OC)-1. The bacterial to fungal biomass ratios had the minimum value at the highest site, which might be related to temperature and soil total nitrogen (TN). The ratios of Gram-negative to Gram-positive bacteria had a significantly negative correlation with soil TN and had the maximum value at the highest site. Leguminous plant coverage and soil TN explained 58% of the total variation in the soil microbial community and could achieve the same interpretation as the whole model. Other factors may influence the soil microbial community through interaction with leguminous plant coverage and soil TN. Soil chemistry and plant functional group composition in substantial amounts explained different parts of the variation within the soil microbial community, and the interaction between them had no impact on the soil microbial community maybe because long-term grazing greatly reduces litter. In sum, although there were obvious differences in soil microbial communities along the elevation gradient, there were no clear elevational trends found in general. Plant functional groups and soil chemistry respectively affect the different aspects of soil microbial community. Leguminous plant coverage and soil TN had important effects in shaping soil microbial community. Supplementary material is available for this article at 10.1007/s11629-015-3614-7 and is accessible for authorized users. Supplementary material, approximately 66 KB.